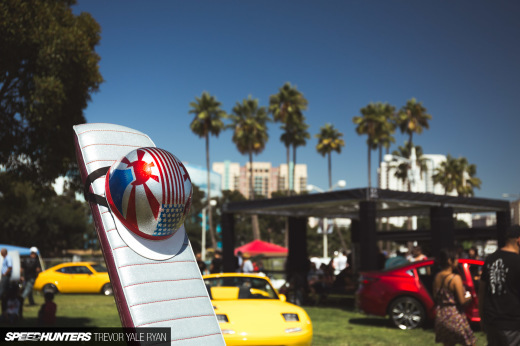 As I mentioned during my coverage from this year’s Japanese Classic Car Show, the thing that makes this event so great is the wide variety of vehicles that gather at the Long Beach waterfront every year. 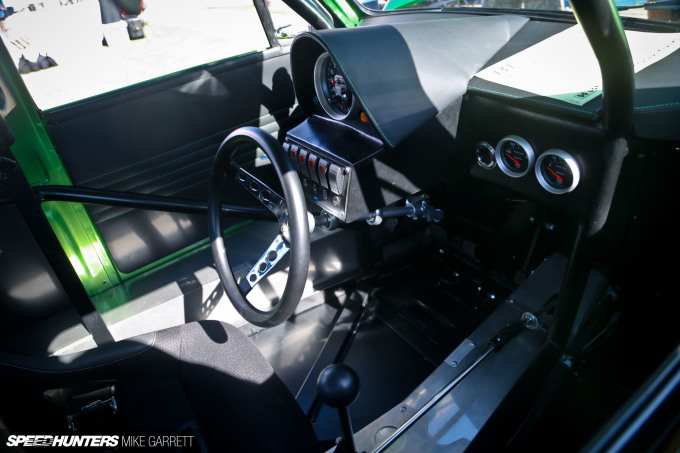 In addition to vintage race cars like the BRE 510 we saw yesterday and meticulously restored rarities, JCCS also brings out a number of radical home built machines. The 2016 show was no exception. 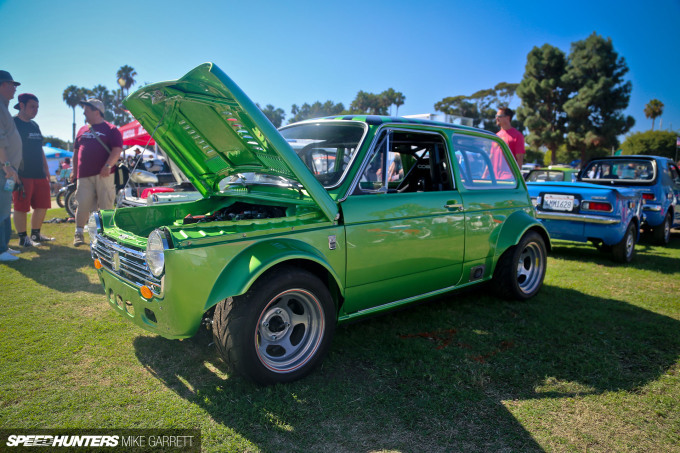 You might remember last year we looked at a Honda N600 powered by an 800cc Honda motorcycle engine. Well, this year that car was parked alongside another N600 that’s equally or possibly even more radical. Owned by Bob Klemme, it’s actually a stretch to call this thing a ’71 N600. In fact, Bob calls it an ‘N1200′, and that’s because of the 1200cc Yamaha four-cylinder superbike engine sitting up front. 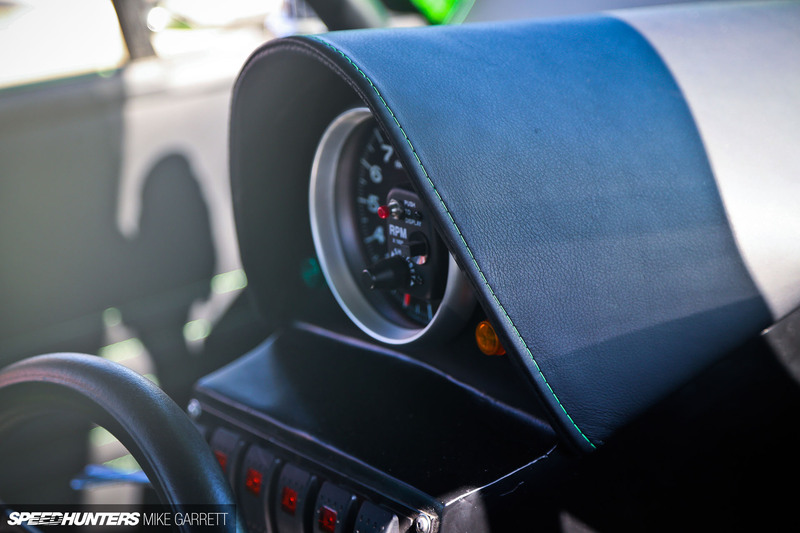 But the 12,500rpm-capable bike engine is just the beginning – the N600 body is actually sitting over a custom rear-drive chassis. The whole thing feels closer to a ground-up built race car than it does any N600 that Honda ever manufactured. 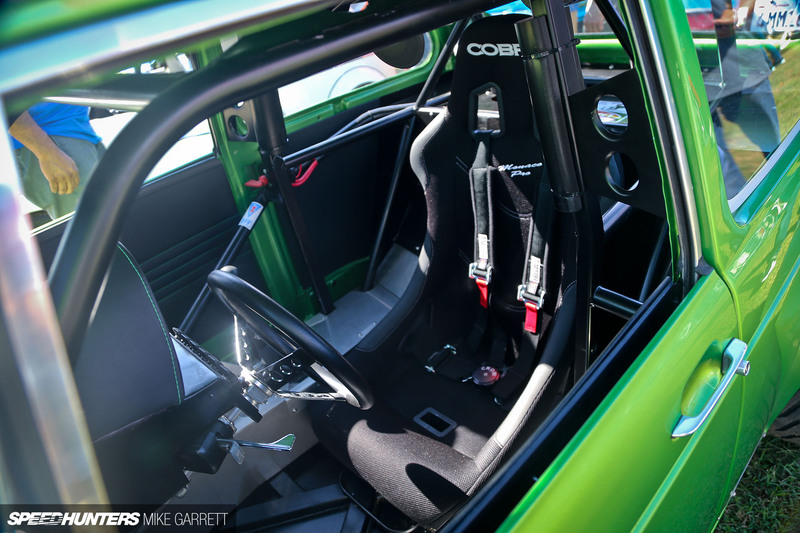 The engine is mated a sequential gearbox, and the driver sits surrounded by a rollcage in a single Cobra bucket seat that’s mounted in the center of the N600’s cabin. There’s also a custom instrument/control panel that makes the whole thing feel that much more exotic. In terms of the exterior styling, the bumpers have been shaved, the hood has been louvered, and the fenders have been flared. And how about that green paint? 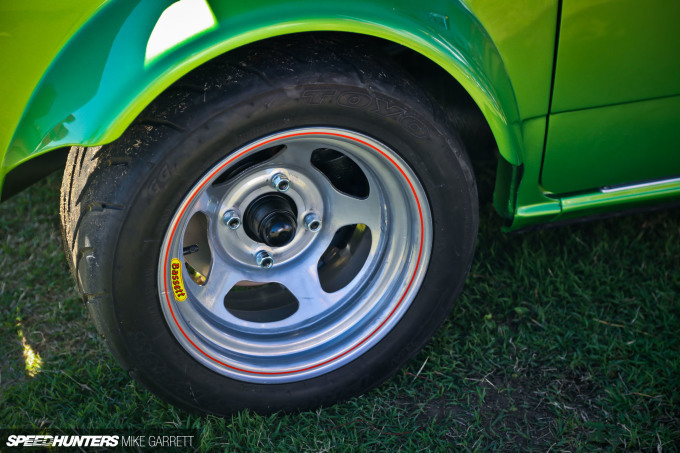 Keeping the N600 stuck to the pavement are a set of Toyo R888s mounted over 13-inch Basset racing wheels. Best of all, the little Honda is completely street legal here in the great state of California. Much like JCCS itself, Bob’s N600 is colorful, unique and damn fun. 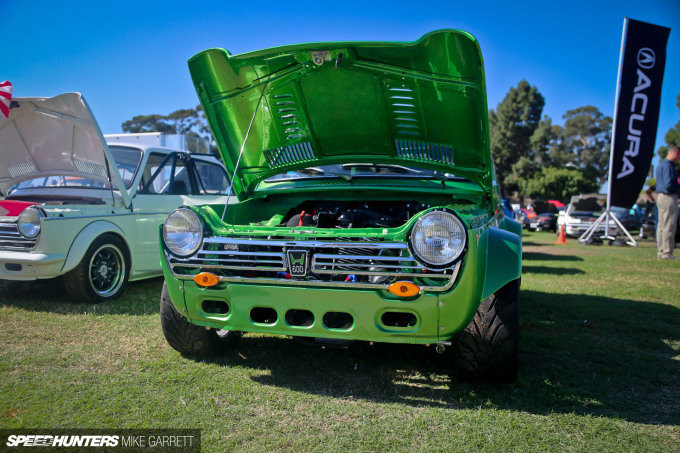 No wonder the Japanese Classic Car Show is such a great event year after year. Stay tuned for more spotlights from Long Beach. The engine mounted longitudinally ? So , FWD or RWD ? RDS " the N600 body is actually sitting over a custom rear-drive chassis"
I love bike engine'd cars, and this one looks really well built, but I'm wondering about cooling that engine. 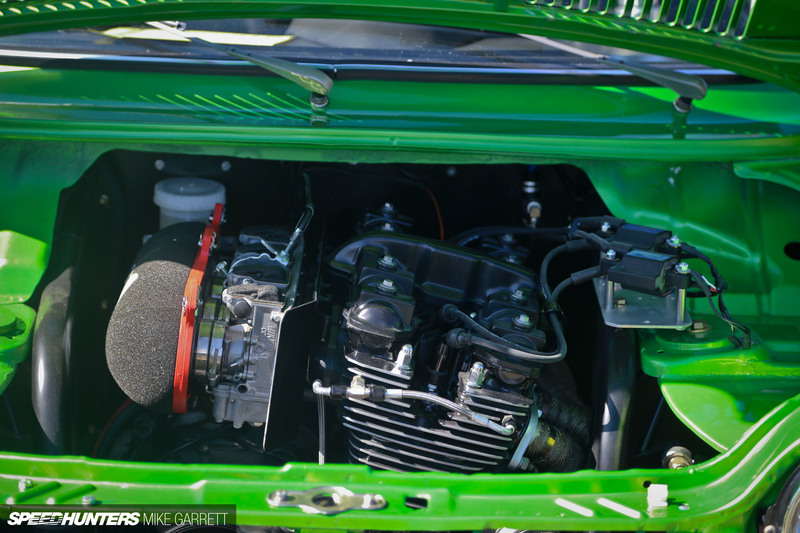 Hiding in an engine bay longitudinally is a big difference from the transverse mount, open air configuration of a motorcycle. How is this street legal? I thought this type of engine swap was prohibited. Option13 I wondered too, but the grille opening seems to be quite large. DerpyToast The car is from 1971. In California, pre-1976 vehicles are not required to pass a smog inspection. You can simply register and drive any pre-1976 vehicle. They do not do any type of inspection on the vehicle. 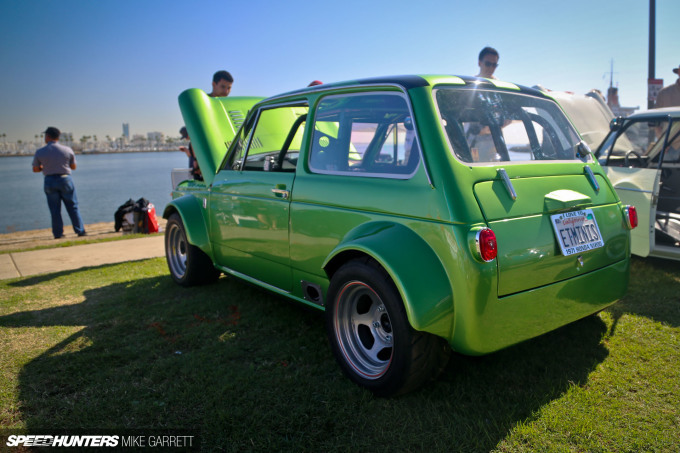 Therefore, this 1971 N600 is street legal because it is smog exempt. I wonder what he's using as reverse or he's just straight flintstoning. Did he just drop an N600 body over a Legends chassis? So wheres the "superbike twist"? 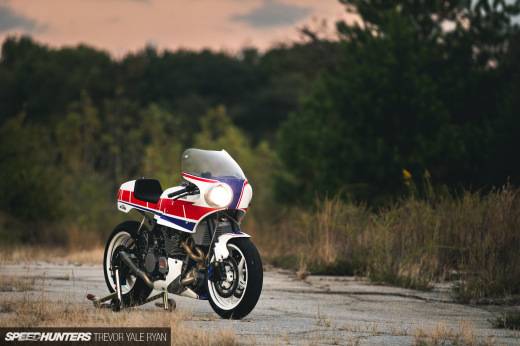 I see an engine out of a sport touring bike, but that's not a superbike, so what gives? Granted calling things what they are isn't as much fun. I'm blind , I read the article twice yesterday without notice THAT quote until now . my mother recently got an awesome white GMC Canyon by working parttime online..
Love those wheels. Bassett Wissota. Unfortunately they don't make 15x8 in 4 lug but you can get them custom. My Uncle Matthew just got a nearly new black Mercedes-Benz GL-Class GL63 AMG by working parttime from a macbook. Haha super funny. 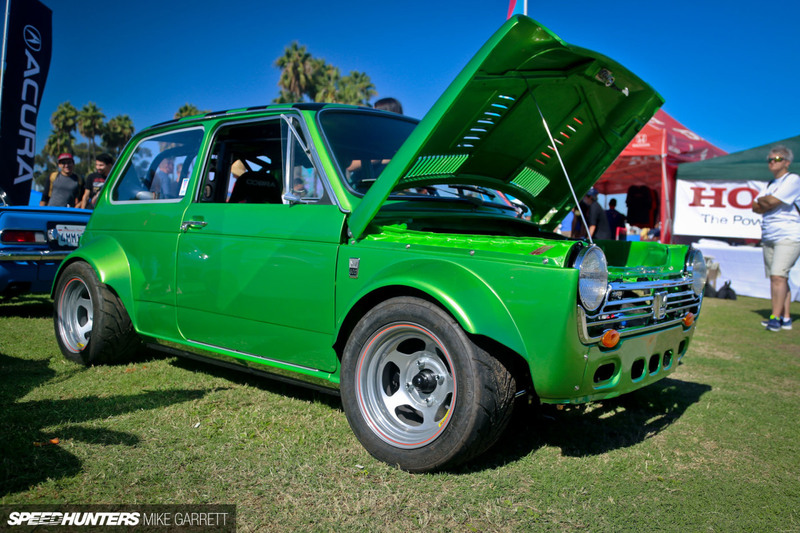 I like old school minis coopers with Honda engine swaps.